The Advanced Diver course further develops your knowledge and skills. You will gain experience in planning and organising dives at different sites and under different circumstances. Additional experience will be gained in using small boats, chartwork. navigation and many other related skills. The good news is that there is no "joining fee" to join MEWBSAC - we really want you to join our Club! 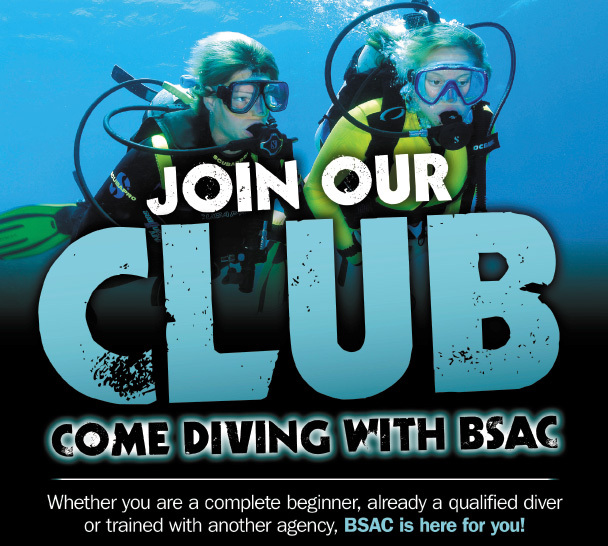 Full Diving Membership of National BSAC (which you need for insurance and qualifications) is £55 annually and MEWBSAC subscriptions are £14 a month. This covers all your training up to your first qualification and we can also lend you full SCUBA kit while you train. Bargain. Do I have to buy a lot of gear? Eventually, yes you do. You will spend between £500 and £1500 on a full set of kit - although we can lend you most of the kit while you are in your first phase of training. Initially, all you need is a mask, fins and snorkel. Over the next few months, most trainees begin to buy their own kit at their own pace - although we usually find that new divers are so keen on their new sport that this happens pretty quickly! This approach to accumulating kit gives time to save or use birthdays, Christmas and discounts available to keep down the cost. It also gives opportunities to discuss, observe and even borrow different items of kit before you buy. You are always welcome to take more experienced divers with you when you buy and there is often good second-hand kit available within the club or through neighbouring clubs with whom we have links. You can contact us using the Contact Form in this site, or can come along to one of our regular pool sessions and make yourself known - we'd love to meet you!! This page last updated on 01/02/11 @ 11:55PM.